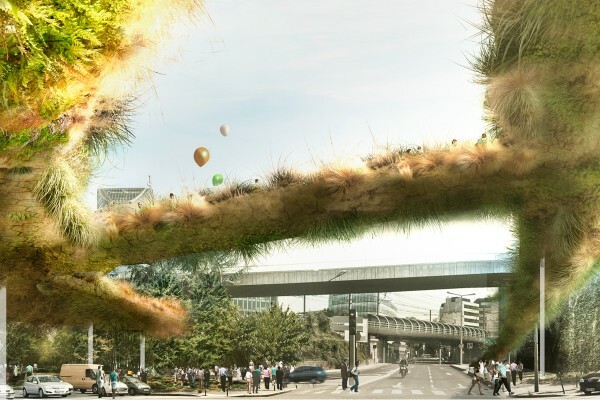 Unlocking the potential in abandoned roads, architecture firm Stephane Malka has dreamed up plans for a vibrant living footbridge, called Parissy, that connects the banks of the Seine to the Boulevard Victor RER station in the Parisian suburb of Issy les Moulineau. The bridge is a continuous green pathway that lifts pedestrians above the congested roadways, creating a peaceful transportation route that adds vegetation to the city. Parissy takes an obstructive element that was meant for, and abandoned by, the automobile, and gives it back to the pedestrian. Malka’s first step is to unify the abandoned roadways into one congruous and clean roundabout. This process not only cleans up lines, but also increases the visibility of both Issy and Paris, by removing unnecessary road structures. Paired down to a single line, the foot bridge structure can shine. The foot bridge provides cooling respite in terms of the planted vegetation on and around it, as well as the natural shade it casts to the roadway below. The landscaped path will change color and density as the seasons also change. The elevated faux-forest, amidst the urbanism of Paris and Issy, is a lush oasis, that combines urbanism, architecture, landscape and land art. Aside from creating a unique and beautiful bridge from Issy to Paris, Parissy creates a serene user experience, and a breath of fresh air- thanks to the vegetation- amongst the big city. Parissy takes an obstructive element that was designed for - and abandoned by - the automobile, and gives the space back to the pedestrian. Malka’s first step is to unify the abandoned roadways into one congruous and clean roundabout. This process cleans up the urban landscape of both Issy and Paris by removing unnecessary road structures. Pared down to a single line, the foot bridge structure shine as it winds its way around town. The elevated foot bridge is planted with vegetation that will change in color and density as the seasons also change. Set amidst the urban environments of Paris and Issy, the faux-forest is a lush oasis that combines urbanism, architecture, landscape, and land art. Aside from creating a unique and beautiful bridge from Issy to Paris, Parissy creates a serene user experience, and breathes fresh air into the big city.